Many boats can claim to be unique in some way, whether by their construction, power or name, but one entry in this year's Marque Class has the distinction in spades. WILD HORSES is her name, and fast fun is her game. She began with a pencil, as all boats do. Her working moniker was BOB, derived from the last initials of her designer, owner and builders. Conceived as a wooden raceboat for today and for the ages, she incorporates the proverbial something old, something new, something borrowed and even something blue into a marvelous vision which sets the standard for significant raceboat replicas which will come after. It was at a national antique boat symposium in 1993 when she first became a twinkle in her progenitors' collective eyes. Ken Bassett, an accomplished designer and builder of wooden boats since 1979, and Tony Brown, a thirty year veteran of wooden boat restoration, had been asked to address the gathering of vintage boat devotees on subjects of interest to those assembled. Between lectures, they compared notes on their personal projects and discussed the possibility of embarking on a new project. Both men felt a devotion to the precepts of the past, yet appreciated the technology which could produce boats stronger, lighter and faster than those of yesteryear. Their desire to build a boat which combined the best of the old and the new was shared by vintage boat enthusiast and Tahoe summer resident Dave Olson, and by the symposium's conclusion, the trio was committed. Ken Bassett was soon at work on the design of a 33-foot go-boat which would answer these particulars, studying the hulls which had made marine racing history in the early 1920s. Borrowing design features from NICK NACK, a Hacker-designed racer which won the Fisher-Allison Trophy (a 150-mile Sweepstakes race) in 1921, Bassett drew a hull with topside and deck lines reminiscent of the era, mahogany planked and trimmed in brass, with a raised deck midships to accommodate a large engine and small forward cockpit, and a larger driver's cockpit aft. Below the waterline, however, adherence to tradition was abandoned, for Bassett's bottom design was thoroughly modern. To the traditional "warped" hull configuration, which employed a constant deadrise of 10 degrees, would be added a planing keel element, 24 inches wide and barely two inches tall, which would be incorporated into the latter third of the bottom. Extending aft of the wetted surface, a raised tail would accommodate the large rudder, helping to break the suction ahead of the propeller and produce more speed. As for the powerplant, Tony Brown owned a Rolls-Royce Meteor engine rebuilt by the Swedish Air Force after the Second World War, which seemed to suit the spirit of the boat. Designed for wartime tank use, the engine was rated at a hefty 600 horsepower at 3,000 rpm at sea level (420 hp at Tahoe), and produced 1,000 foot-pounds of torque. The partners conferred by letter and phone, and with a few modifications, the final drawings were completed and approved by all. 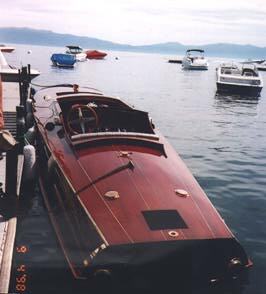 The boat would be built at Tony Brown's Western Runabouts shop at Sunnyside on Tahoe's west shore, and, owing to the time constraints of Bassett's own Vermont boat business, she would be completed in stages, the first one to begin in February, 1996. Bassett arrived on the construction scene with a roll of drawings under his arm and a pencil behind his ear, confident in the manner of a man who knew his work. Mystified by the process in which they were about to play a part, Brown and his crew watched as Bassett's pencil began to do its work. A table of offsets was developed and 33 feet of plywood sheets, butted end-to-end, were painted on one side and began to be filled with cryptic notations such as AP, FP and CL. Soon Bassett had reduced the 33 foot drawing to a series of cross-sections, one for each of the boat's 20 stations. A plywood template was then cut out for each station. A pile of dimensional fir lumber was soon turned into a framework on which the boat would be built, and a multitude of shims was placed beneath their component pieces to make a level surface against which all future measurements could be referenced. The templates were soon put to use as guides for the construction of mahogany frames, and as these were fastened in place, the shape of the boat was defined at regular intervals from stem to stern. 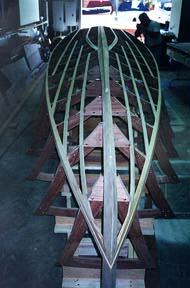 A laminated white oak keel and Philippine battens were then fastened to the frames to make a cage. Three layers of special Greek Sapili plywood were cut, finished and fastened to the cage bottom with epoxy and staples, the layers again alternating direction and each layer faired before the next was fastened. A flow-coat of epoxy was then applied, and when it had cured, the hull was turned right-side up for the planking of the topsides and deck. Twenty-two foot lengths of 8/4 African mahogany in 14 inch widths was resawn and bookmatched for this purpose, forming the visible layer of all above-the-waterline surfaces. Cockpit and hatch carlins had already been constructed, and to these dash and trim were now added, giving the boat her definition. Now attention turned to her finish, and sleeves of sandpaper were consumed in the pursuit of a fair, smooth hull. A dark stain was then applied, followed by coat upon coat of varnish. Meanwhile, WILD HORSES' mechanicals were being completed. Some of the boat's hardware and many of her internal components (including exhaust system, running gear, steering components and frame reinforcements) were fabricated by Meddco Metals, the owner's company. WILD HORSES' deck hardware and rails had been fitted, and following her final coat of varnish, these were fastened in place, in preparation for her launching. Three winters had passed since WILD HORSES had first been lured to the drawing board, and now it was time to see what she could do. As her 4,500-pound package was centered on Sunnyside Marina's forklift for a ride across the highway and into the drink, all present were filled with a mixture of relief and terror. The inevitable butterflies attending such moments of proof were aflutter. WILD HORSES was now slowly lowered into the water and preparations were made to cast off. Her Rolls-Royce fired and broke into its characteristic low rumble. Lines were cast and she idled tentatively away from the pier. And then suddenly she was off, riding smooth and steady across the surface of the sky-blue Lake, fulfilling a vision, a delight to the eye.. She is the first new scratch-built power boat to find her way to these waters in many a year, but her builders (and all fans of the fast and beautiful) hope that she will not be the last. Visit her among the race boats on display at the Concours and see if you don't find her beauty timeless and her place in Tahoe boating annuals assured.